An analysis of data from early-phase clinical trials indicates patients treated with targeted cancer therapies have a lower risk of more serious side effects than with traditional chemotherapy. The findings from researchers at the Institute of Cancer Research in London, U.K., and Royal Marsden NHS Foundation Trust appear in this month’s issue of the journal Annals of Oncology (paid subscription required). The team led by medical oncologist Rhoda Molife analyzed data from 36 phase 1 clinical trials run by the two organizations. In phase 1 trials, researchers test an experimental drug or treatment on a small group of people for the first time to identify side effects, as well as evaluate its safety and determine safe dosages. Recent studies show that patients in phase 1 trials of new-generation targeted drugs respond at about twice the rate of conventional treatments, but little research had so far documented the incidence of adverse side effects from targeted treatments. In this retrospective study, Molife and colleagues investigated trials held between 2005 and 2009 involving 687 cancer patients, with gastrointestinal, gynecological, and sarcoma or soft-tissue cancer the most common types. The researchers compared the incidence of life-threatening adverse effects for patients receiving molecularly targeted treatments, which attack specific genetic or molecular faults driving cancer growth, versus patients receiving conventional chemotherapy that kills all rapidly dividing cells. The findings show the overall risk to patients of suffering a life-threatening side effect is some seven times less for molecularly targeted treatments than for conventional chemotherapy. The most common toxicities with targeted therapies were gastrointestinal, such as loss of appetite, diarrhea, and vomiting, as well as fatigue. 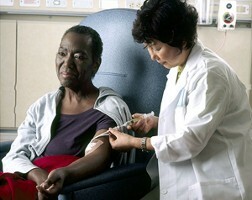 For conventional chemotherapy, the side-effects are generally hematological or cardiovascular in nature. The study shows as well that patients given a higher dose than that which the trial later found to be optimal, or if were sicker when they joined the trial were more likely to suffer side effects from the treatments. Regulations biomedical, cancer, clinical trials, Europe, life sciences, pharmaceuticals, U.K.